If you need a good New Year’s Resolution for 2013, we recommend making a commitment to seeing more live music. While good shows tend to be a little more few and far between this time of year than during regular tour seasons, there’s plenty of good music to get you started on the right foot this year. This week alone boasts a couple can’t-miss sets. Sultry, soulful folk pop with retro sensibilities yet totally modern composition. 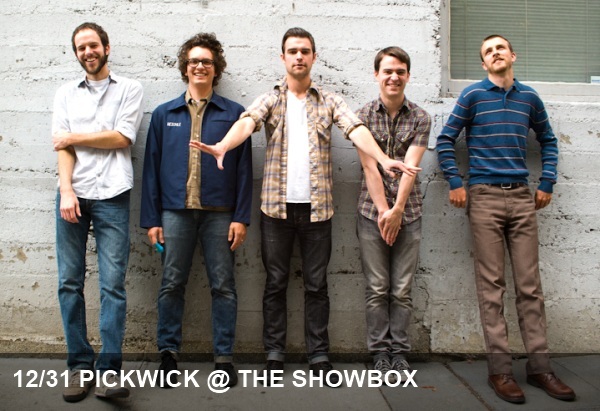 If you are still looking for awesome plans for New Year’s Eve, we recommend joining the fun at Showbox with Seattle’s own Pickwick. The unassuming band of boys packs an unexpected punch and will have you on your feet all night as you welcome 2013. The show is expected to sell out, so grab your tickets while you still can. Up-and-coming dark dance-pop trio that is finally coming into its own with a fantastic new album featuring psychedelic and house tinges . You’ve probably seen us tout PonyHomie time and time again. And there’s a good reason for it – they are one of our go-to electro-pop picks. If you have yet to check them out, this is the night to do so. With a brand new album hot off the presses and a sound that has matured like a fine wine over the past couple years, this show will serve as yet another great kick-off to 2013. For a look ahead at some of the other great shows coming up in the first few months of 2013, be sure to check out our freshly updated calendar.